The dialects of Valais and the Walser connect the Valais with its colonies that emerged in the 13th and 14th century. Linguistically, they belong to the high-Alemannic language group- belonging to the highest of the southern alpine borders of the Alemannic (Zinsli). The characteristic sounds, the ancient forms and terms of the Walser are mainly to be found in the German-speaking Valais. However, there have been independent developments in the far scattered colonies during the 700 years of special separation. The immediate vicinity of Roman or other German dialects had varying strong effects in the local colonies. There are elements which the colonists brought with them from Valais that disappeared there. Similarly, Valais’ inheritance of language disappeared in the colonies. Valais itself is rich in linguistic facets. The dialect of people from Lötschental, Goms or Zermatt are- sometimes even from locality to locality- very distinct. Around 1300, the migrating people from Valais also spoke a varying Valais-German. 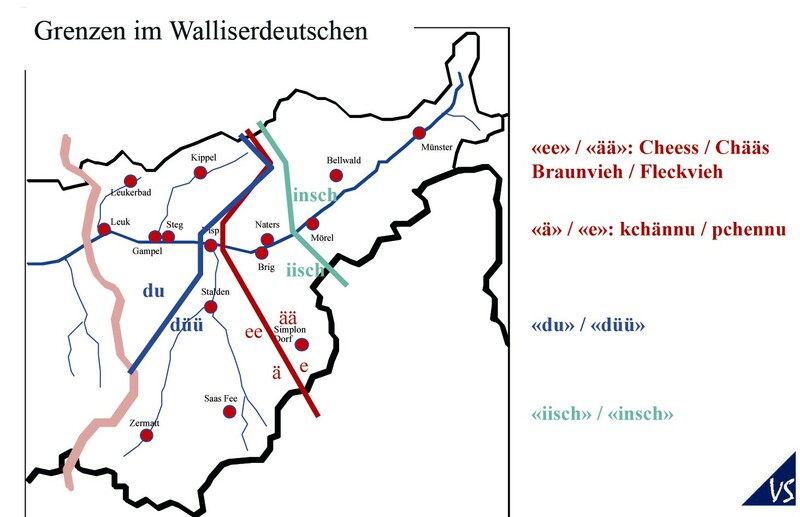 The Walser’s linguistic relationship to two speech areas of Valais indicate this. The reason for this division lies in the Alemannic colonisation of Upper Valais in the 7th century: the upper part of it was populated over the Grimsel whereas the lower part was populated over Sanetsch, Rawil and Gemmi. The groups collided in the region of Brig-Visp where the border “schweer-schwäär” is still seen today. This line also represents the border between two Swiss main breeds of cattle, the “Simmertaler Fleckvie” and the east Swiss “Braunvieh” (spotted and brown cattle). Settlers from the eastern part of Upper Valais migrated to Pomatt and then to Obersaxen, Rheinwald, Vals, Safien and Avers. From the western part of Upper Valais the colonisation in Davos and Vorarlberg took place. The linguistic division can also be proofed with the following distinct words leer/läär, Chees/Chääs, schtreela/schträäla. Walser-German is different in Gressoney (Greschoneytitsch), Issíme (d’Éischemtöitschu), Rimélla (Rímällju), Pomátt (Pumáttertiitsch) and Rheinwald (Rhiiwalder Titsch). Also in Tannberg and Mittelberg the terms for “we speak German” vary. These differences bring up the question: which are the common linguistic elements of the people from Valais and the Walser? Can they still be found today?